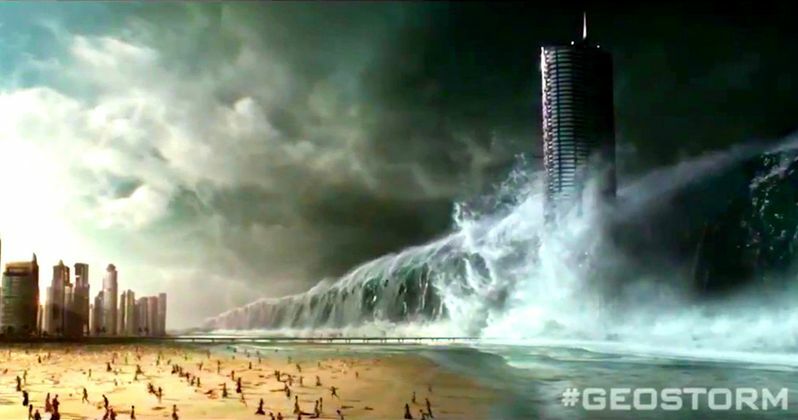 This October, the entire world will face deadly, devastating weather that will be impossible to survive in Geostorm. The first trailer for this thriller will erupt like molten lava tomorrow. Today, Warner Bros. and Skydance have unleashed several teasers from around the globe. Perhaps the most surprising thing about Geostorm is that it's not directed by Roland Emmerich, the modern master of devastation. This story, about the failure of climate-control satellites that threaten to unleash a worldwide storm, is helmed by Dean Devlin, Emmerich's longtime collaborator and producer behind such hard hitting destruction machines as 1998's Godzilla remake, Independence Day and its more recent sequel Resurgence, Eight Legged Freaks, and Stargate. Geostorm stars Gerard Butler. He plays a stubborn yet charming satellite designer who, when the worlds climate-controlling satellites malfunction, has to work together with his estranged brother to save the world from a man-made storm of epic proportions. A trip into space follows, while on Earth a plot to assassinate the president begins to unfold. Warner Bros. and Skydance say this about what we can expect on the weather front tomorrow. "Tomorrow the world will be taken by storm. #Geostorm"
So, if you want to find out what is happening around the world in terms of the weather, you better return here in the AM for a full report. There are two more videos, one shows a massive tidal wave forming only to freeze, and another shows Russia being encompassed by a snowstorm that soon turns blazing hot. While terrifying, it's all in good fun. Geostorm has a fine ensemble cast that includes Jim Sturgess, Abbie Cornish, Ed Harris and Andy Garcia. The script is written by Kieran and Michelle Mulroney and Dean Devlin (Independence Day, Stargate). David Ellison and Dana Goldberg are producing via Skydance. Also producing are Devlin's partners at Electric Entertainment, Marc Roskin and Rachel Olschan. Paul Schwake will executive produce. Geostorm touches down in theaters this October 20, just in time to give you a few good scares heading into Halloween. Also coming on that date is the anticipated sequel Insidious Chapter 4. And the long awaited return of Jigsaw will strike in Saw 8: Legacy just one week later. As you can see by these first video clips, this is going to be one hell of a fall for scary movies. Remember to return tomorrow for the full weather report.